I always thought the most intriguing aspect of historical maps such as the Carta Marina are the fantastic beasts and odd creatures depicted on them: Humanoid figures without heads, sea serpents swallowing ships whole and dragons terrorising villages. Many of these depictions are based on Roman and Greek myth or on tall stories told by sailors over an ale. 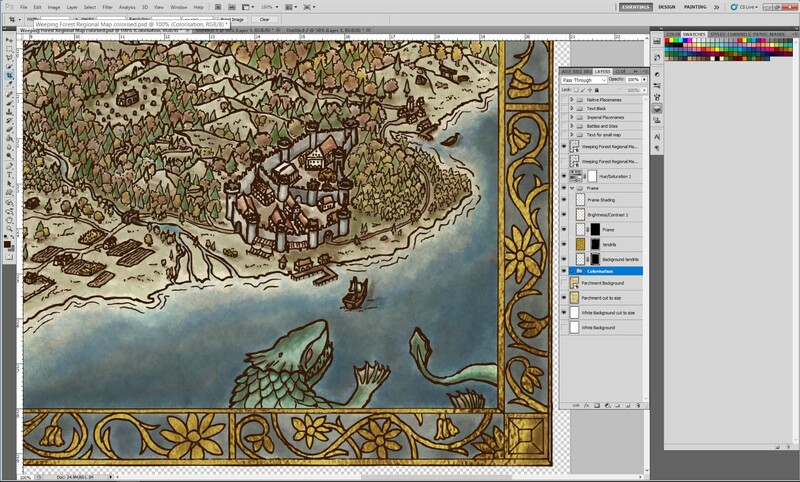 But how can you add such beasts to your own maps and how do you go best about coloring the map? In this short tutorial I will show you one way of drawing such beasts and digital colorisation techniques. I already covered the basics in another posts that gives you an introduction to hand-drawn maps. In this installment we draw a much more detailed map and use layers of translucent color instead of layer masks to bring the map alive. So come along and explore the Margravate of Greifshold with me, but be warned that we will meet dragons and sentient mushrooms in long forgotten ruins, serpents deep below the waves and fierce tree guardians deep inside an autumnal forest. Before you start sketching your map it stands to reason to develop a rough historical background and to think about the people and creatures who inhabit the land, as a landscape is always shaped by their struggles and achievements. A rugged landscape could tend to have only small disjointed settlements or one major city where people convene for protection. A land-locked kingdom may focus on maintaining its borders, while a coastal power aims to extend its reach across the sea to colonise new lands. A war-torn region will be again different to a region that saw peace for a hundred years. Are monsters roaming the wild a common sight or have centuries of adventuring made those beasts almost extinct? About 100 years ago explorers discovered a new continent rich in natural resources. The coastal waters were teeming with fish and soon whalers and missionaries followed the explorers. They established a small outpost and told visiting travelers about the riches and wonders of this uncharted land. A few years later an expeditionary force landed on this new continent. With little regard to the native tribes they founded the city of Greifshold and subjugate the tribes by force. The newly established Margravate expanded to the northwest and northeast and established footholds. The disgruntled native tribes banded together and rebelled against the invaders. At first they had some success reclaiming the northern forest, but after some years of guerrilla warfare they were crushed by the Margrave. Ten years later some of the wounds have healed, but there is still tension between the colonisers and the natives. In the south-east you find the city of Greifshold, with the small fishing village Breka to the east and the remains of a temple to the north. Deep under the sea they say a serpent waits to swallow trade vessels whole. In the west travelers report of sentient mushrooms, defending their territory fiercely. Some say a mushroom king holds court on a throne made of precious stones and pure gold, while in the east sentient trees guard remains of an ancient civilisation, unwilling to share its secrets. The nomadic tribes of this land consider the mountain range that forms the northern limits of Greifshold to be the fossilized remains of an ancient, powerful being: a child of the gods, the first dragon and mortal enemy of the sea serpent below the waves. It is said an old pass leads to a portal, hewn in the very rock of the mountains, but where it leads nobody knows. 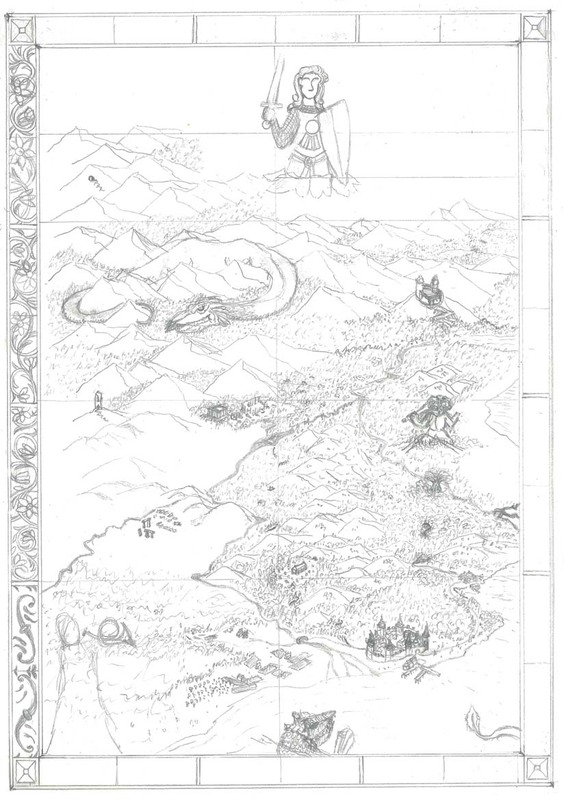 After you decided on the background you can start sketching your map. Depending on your preference you can use pencil or a tablet for this step. 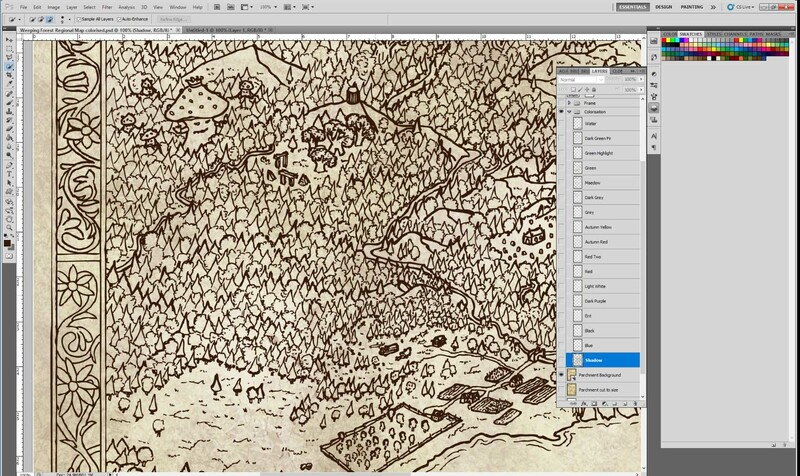 If you do the entire map digitally you obviously save yourself the scanning, but there is something to be said to sketch and ink it the old-fashioned way. Start with a simple frame and think about the geographical features the map should show. Do you want to draw an entire continent or just a small area map? 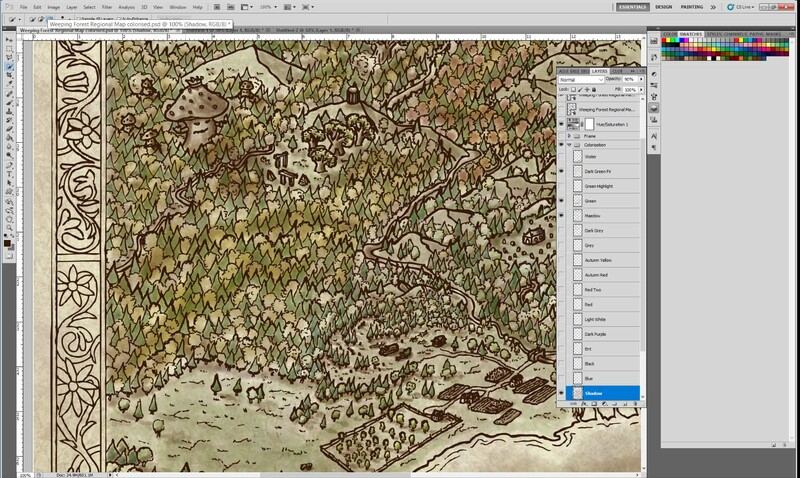 The larger the scale the more abstract your map: Settlements are depicted using symbols or a small icon, mountain ranges and forests won’t show singular trees and beasts may be something to adorn the corners or the frame of your map. 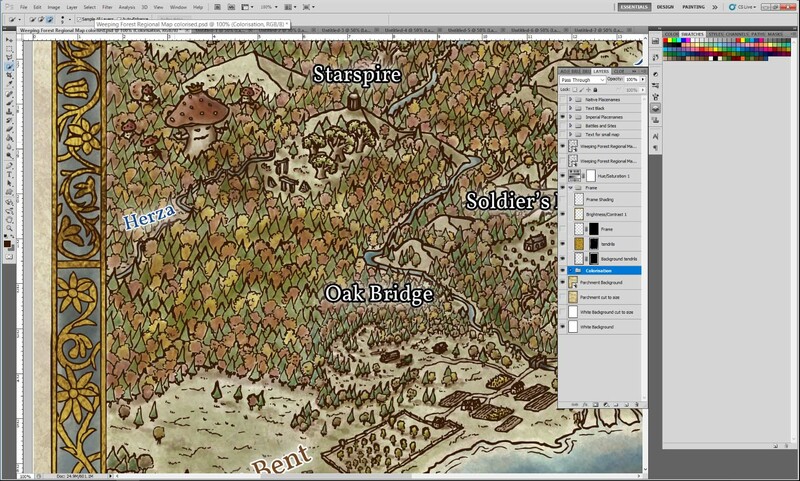 If you want to draw a map of a smaller area you will need to add more details. Settlements may show singular houses, a city wall may be visible and singular trees will stand out. 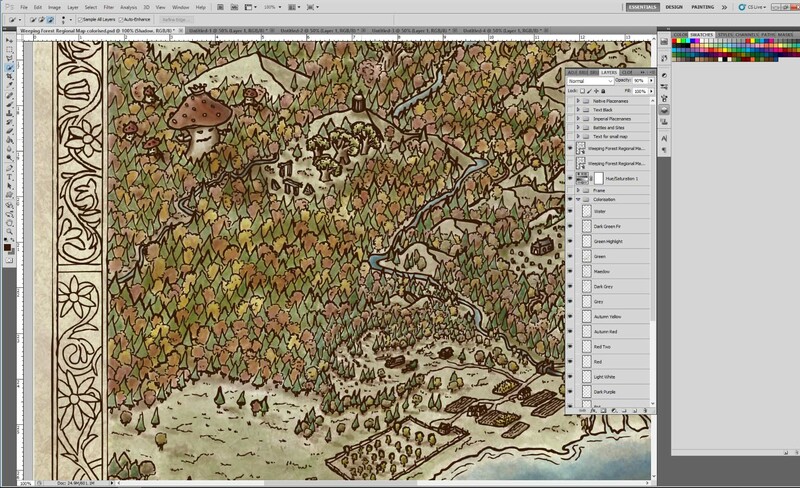 The beasts can be more easily depicted in perspective interacting with the landscape: A sentient fungi would easily tower over city and mountain alike on a large-scale map that shows continents or a whole world, but on an area map the fungi can walk through the forest and won’t look too much out of scale. You can also add more detailing such as scales and facial expression, which may be difficult if your beasts are only a centimeter tall. You can make the sketch as detailed as you desire. If you are a beginner more detail will help you during the inking process and guide your hand. However, it is very likely that the finished piece will look quite different and details will change. The sketch does not have to be perfect, but make sure that the overall composition is to your liking. Keeping the historical background in mind I divided my canvas into a 2 x 4 grid and aimed on having something of interest in each of the sections: A ruined castle on a hilltop, a dragon curled around a mountain range, a small fishing village and so on. My goal was to give the beholder a reason to let the eye wander over the map and to engage him or her with evocative details. It is easy to imagine a build structure like a house as a combination of geometric shapes, accordingly drawing them in perspective is much easier than organic shapes. However, you can also imagine a creature as a conglomeration of geometrical shapes. For instance the dragons neck is basically a cylinder that winds around the mountain. Both the head of the dragon and the sea serpent can be seen as triangular or square based pyramids. Bodies turn into prisms or cuboids and so on. Rotate these shapes in your head and think how they would look in perspective. Sketch these simple shapes and then round them off to make them appear more organic. Add details, like teeth and scales only when the basic shapes have been established. As you can see the serpent started with an odd fin instead of an arm and was much longer than in the final version. The upper part of its head resembles a shark’s head and the yaw and scales still need refinement. Don’t be afraid to experiment. See what happens if you add a line or change its curvature. At the sketching stage your eraser or Ctrl+z is your friend. Try to stick to your perspective of choice. 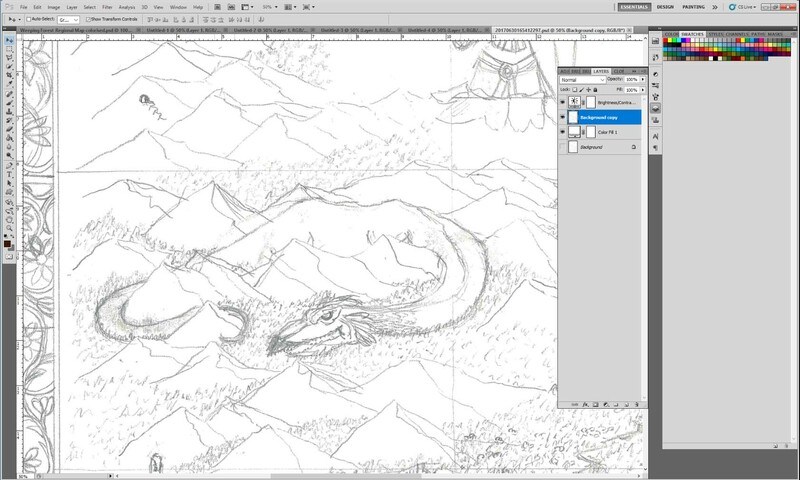 If you draw an isometric map it would seem odd to draw a dragon with a vanishing point. The entire dragon can be seen as a combination of shapes: A cone for the tail, a triangular prism for the body, a long cylinder for the neck and finally a cone or triangular or squared based pyramid for the head. You can use this method for pretty much everything: Temples, ruins, farmsteads, mountain ranges etc. First establish the basic shapes then add to it. When you are satisfied with your sketch take out the micro pens and proceed to inking. 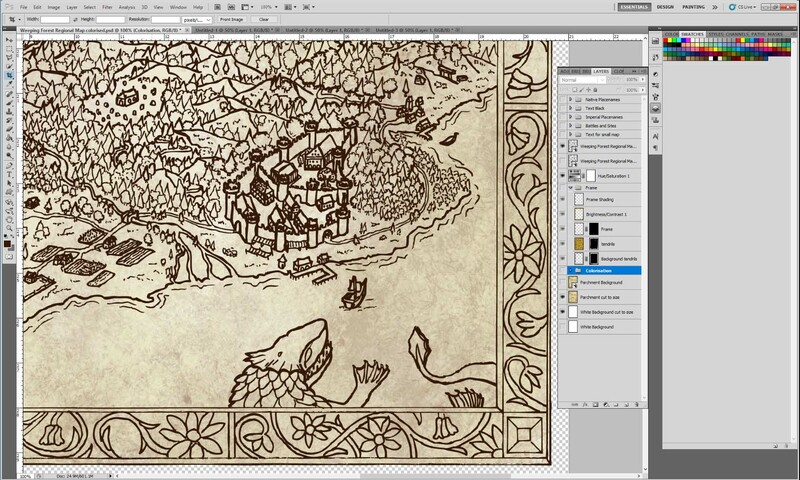 At this stage it pays off to use different line weights to emphasise certain elements on your map. For instance the outline of the serpent is drawn with a 0.45 mm tip, while the scales, fingers, eye and teeth are drawn using a 0.05 mm tip. In addition some of the tree and hill silhouettes are pronounced using a larger tip. This way the hills stand out more easily against the surrounding forest. In case of the trees this change of line weight indicates that they are slightly elevated in comparison to the trees directly behind them. 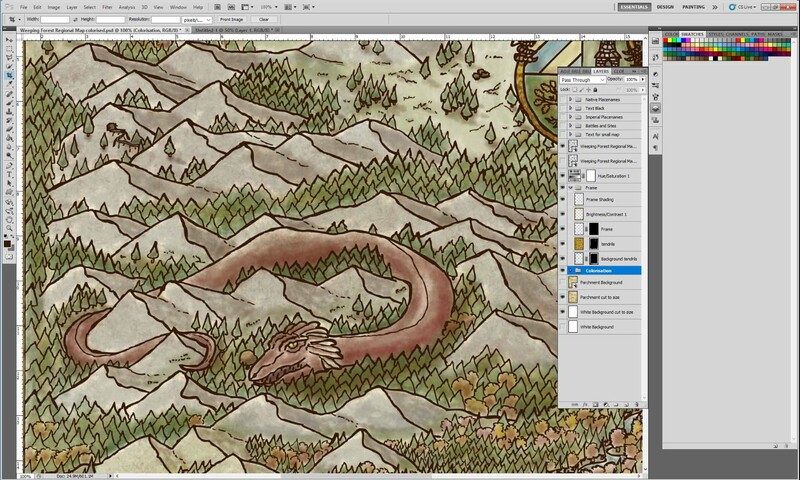 The serpent moved to the right edge of the map and the detailing has been cleaned up. 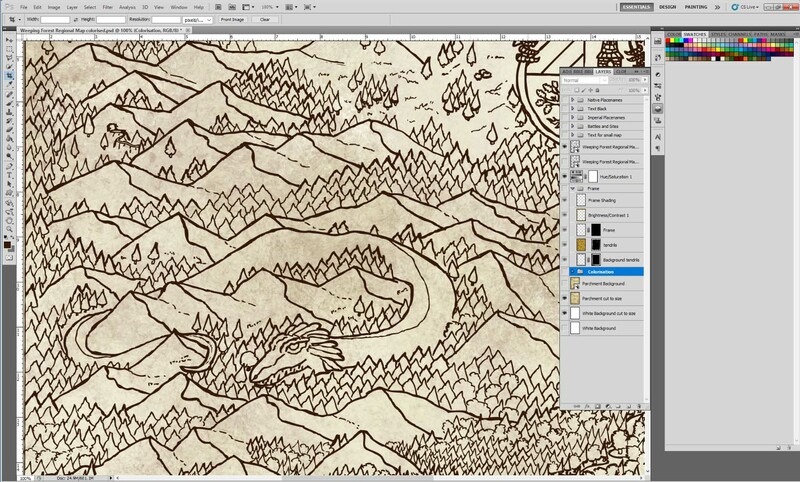 Both the dragon and the mountain range stand out more than the surrounding forest due to the difference in line weight. Do not rush the inking and draw confidently. The sketch will help guide your hand. If you make a mistake you can always delete it later. 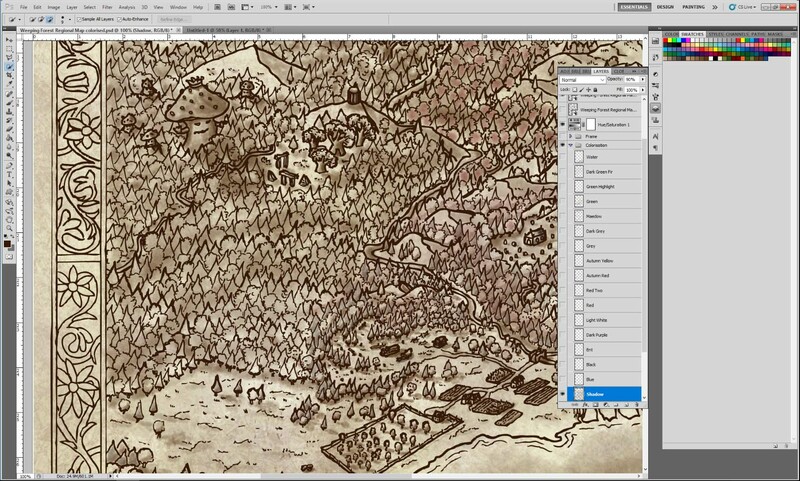 This process can take several days worth of hobby time for a very detailed map, but it is very satisfying when you see the finished piece. 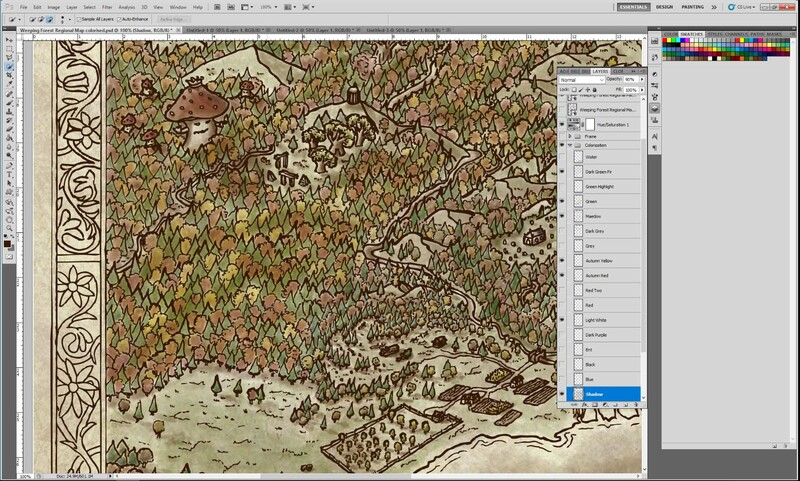 All that is now left to do is adding some colour to your map. When you are finished with inking remove any remaining sketch marks and scan your work at a high-resolution. If you work digitally this is obviously not necessary. Start with a white background and a parchment texture. The idea is now to first shade the map and then add different layers of transparent colors to achieve a water-color effect. Naturally you can attempt to emulate other styles, but for my map I chose this specific style referencing historical maps, but also illustrations in children’s books. Create a new layer for each color in your editing program of choice. This way you can always tweak things and – not unlike miniature painting – add layers to change the hue and depth of an underlying layer. To the right you can see the different Photoshop layers that make up the document. Use groups and descriptive names to keep everything tidy. We start with the shadows. I use a dark brown grunge brush with an opacity setting of about 20% and slowly make my way around the map. The layer mode can be “Normal”, “Overlay” or “Soft Light”, depending on your preference. You can increase opacity if needed. The goal is to achieve smooth transitions. To add interest I changed the brown tone slightly and also experimented with the color dynamics settings in the brush panel. Keep the light direction in mind. In my case the light comes from the top left. After the pre-shading is finished you add layer after layer of translucent colours. For instance the forest is first coloured green followed by autumnal colors such as yellow and red. I use 30-40% opacity, with the aim to achieve smooth transitions and to let the underlying colours come through. This way you can create a more complex texture. The same red is also used for the Mushroom king and his fellow fungi, while an off-white is used on his stem. Using similar or the same colours on the beasts makes them part of their surroundings and thus integrates them into the map. To differentiate deciduous trees from evergreens I used different shades of green. Autumnal colours are now added on a separate layer to modify the underlying green layer. The same principle applies to the mushroom man in the corner. The same idea is used on all remaining features, such as water, buildings, fields and so on. You can use slightly modified shades for other details to keep the coloration cohesive. I also had success using the color dynamics setting to add further variations to the forest or the mountain range. The sea serpent is not different to the other elements: Try to imagine where the light comes from and shade the body of the serpent with a dark brown accordingly. Now add additional layers of turquoise and light blue. The dragon is actually more of a Wyrm (or a Tatzelwurm in German). It has no wings and a smooth, snake-like skin. Adding color and an iris to the eye is another nice touch that will bring the beast to life. The beast also casts a faint shadow on the trees which further integrates it into the map. The frame can be colored using the same techniques outlined above, but if you would like to add a gold leaf effect as I did, a slightly different approach is necessary. First off choose a background color for the gilded parts and block it in. I went for a dark blue. I did not aim for an opaque coat, much rather I wanted the background to be patchy with some of the parchment texture coming through. Now it gets a bit more complicated. To achieve the gold leaf effect you first need to create a gold texture. I found this very helpful tutorial that will show you how to create such a texture and also how to make a gilded text. We can use the same idea for the floral design of the frame. You basically need to cut out the floral design so that it shows the gold leaf effect, but not the other parts of the map. This can be achieved using a layer mask and carefully removing the areas were you want the effect to show. This is time intensive, but can be sped up if you drew the frame border and the design inside the borders on separate layers. 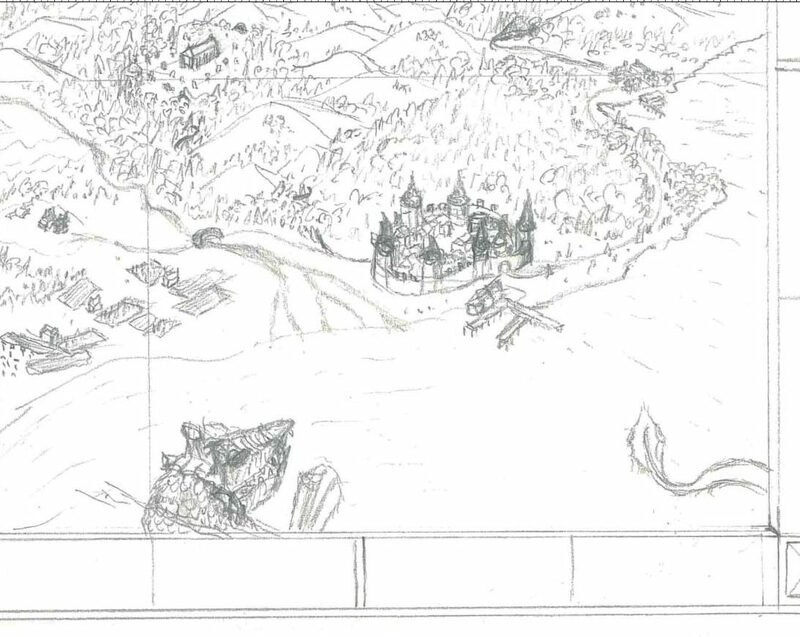 If you draw the map by hand this is obviously difficult to achieve and you may need to use the quick selection tool. You can further refine the frame adding a shadow layer to emphasise the reflective qualities of the gold leaf. All that is now left are the labels. White text with a black outline and a very faint glow in the background works very well for location names, while I chose a brown with white outline for area names. About the place names: The native peoples’ language is inspired by Old High German, and thus rivers kept their native name. English is the common language among the colonists and thus other sites are renamed by them. That way the placenames reflect the history of the region. And there we have it: a nice map that can be used for a roleplaying or wargaming campaign or just as a stand alone piece to put on the wall of the man cave or femme den. I hope you enjoyed this short tutorial and give it a try yourself. If you have any questions, remarks or suggestions comment below. Whatever you do, always wield your brush with honour! 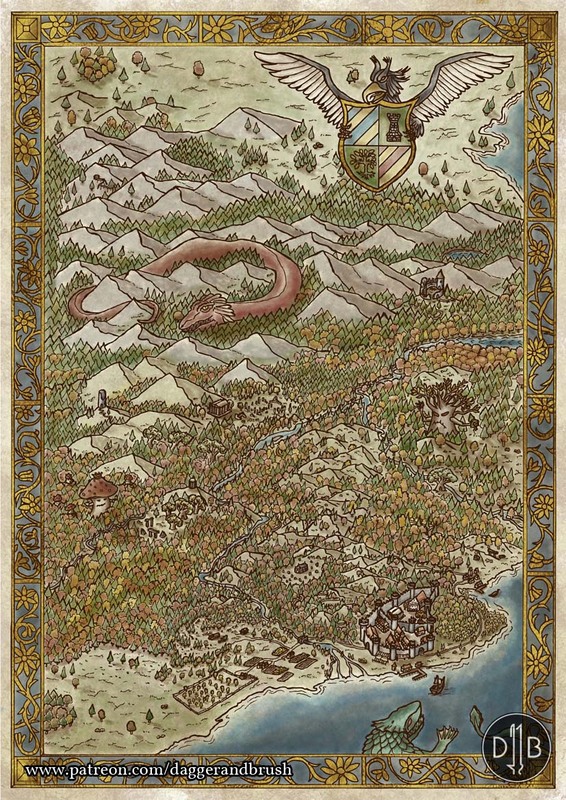 If you like the map and need a notebook for your next DnD session, a mug or poster for your office, a new cover for your smart phone that shows your love for all things fantasy or simply a nice art print to hang into your man cave or femme den, check out my store on Redbubble. If you would like a constantly updated, themed PDF terrain building, painting and roleplaying guide consider supporting me on Patreon. You will get access to a high-res version of the map, different versions of the frame and also to detailed background materials on the history of the Margravate to aid DMs. There also other choice rewards for supporters. If you are not keen on Patreon or Redbubble, but enjoy my content and would like to see me well caffeinated so that I can publish tutorials, reviews and guides more frequently, click below and buy me a cup of dark, mellow goodness. Thank you Thomas for your comment. Glad the tutorials was an easy and clear read! What a stunning map, it´s an really impressive job you have done here! Thank you Utgaard, much obliged. Took a while to complete it, but it was a fun project. I hope to add more maps depicting east, north and west of the continent, so that they can be combined to a much larger map in the end. As usual, your work is so impressive. Love the map and the post tutorial. Thanks! Thank you Mark! I am glad you like the map and the tutorial is of use! Thank you for your comment! Pleased to read that the map is to your liking! Beautiful work. That’s one evocative map! Thank you Arkie. The idea was indeed to evoke a certain atmosphere and feeling for the setting without the need for text or labels. Great class and an awesome result on the map and dragon. A belated thank you! Glad you enjoyed learning about the beasties. Enter your email address to join the Order of the Brush and receive notifications of new posts by email. All product and company names are trademarks or registered trademarks of their respective holders. Use of them does not imply any affiliation with or endorsement by them. All photographs, texts and video clips were created by the author if not stated otherwise ©2018 DaggerAndBrush Blog. All rights reserved. Tarvasjõgi by Ireen Trummer (Own work) [CC BY-SA 3.0], via Wikimedia Commons was used as a forest backdrop in a number of photographs. The transformed works are distributed under a [CC BY-SA 4.0] license and should be referenced “Picture by DaggerAndBrush (Own work) [CC BY-SA 4.0], via Wikimedia Commons, based on Tarvasjõgi by Ireen Trummer (Own work) [CC BY-SA 3.0], via Wikimedia Commons. Data protection is of a particularly high priority for me as administrator of the DaggerAndBrush Blog. For a detailed outline of the personal data I and Automattic process when you visit my site please refer to my privacy statement.